But inversions don’t have to be scary. If we change our perspective and start small, like in Downward-Facing Dog — which in itself is an inversion — we can gradually strengthen and work towards the more advanced asanas. These scary poses will start to feel a little less terrifying and a lot more exciting. And if you want to see your progress go faster, go on an Ashtanga Yoga retreat and you might be able to do more complicated inversions in just a few weeks. What are Inversions in Yoga? To put it simply, inversions are postures that take you upside down. E.g. they bring the hips higher than the heart and the heart higher than the head. They are an integral part of a yoga practice and there’s an inversion for every level in yoga. From Balasana (Child’s Pose) to Adho Mukha Vrksasana (Handstand), no matter where you are in your practice, you’ll always be able to find a way to get upside down. Yes. Mostly. In truth, it depends completely on the person performing the inversion. Anyone with spine, neck or head injuries needs to take extra caution when practicing inversions, as does anyone with high blood pressure or cardiovascular problems. When we say high blood pressure, we’re referring to anyone with high blood pressure who is not doing anything to control it (i.e. taking medication). In general, though, those who have high blood pressure and take medication to lower it can usually perform the same exercises as someone who has normal blood pressure, but it’s still best to incorporate inversions gradually into your practice. Anyone who is completely healthy still needs to take precautions when practicing inversions. Warming up properly, listening to your body and progressing slowly are good tips to take into consideration when going upside down. Poses like Sarvangasana (Shoulderstand) and Sirsasana (Headstand) can place a lot of pressure on the upper back and shoulders and need to be approached carefully and mindfully. That being said, if you’re newer to the practice, or simply still working on strengthening your core and stabilizer muscles, there are many safe ways to get inverted without relying solely on your head and neck to hold you up. We’ll talk about this a little more below, but to give you an idea, Viparita Karani (Legs up the Wall Pose) or using a wall to help you stabilize and strengthen the body as you prepare for Handstand are both good ways of going upside down without worrying as much about falling over or injuring yourself. Regardless of where you are in your practice, always take care when practicing inversions. Practice your inversions supervised by an expert on a yoga retreat! It’s said that turning yourself upside down will get the fountain of youth flowing inside you. When we go upside down we ignite our seventh chakra, sahasrara chakra or crown chakra, where it is said that amrita, the ‘nectar of immortality’ is held, and it naturally flows through our bodies over the course of our lives. Because of this, it’s thought that going upside down keeps our amrita at our crown chakra, preserving it and therefore allowing us to live longer. When we turn upside down, we give our hearts a few moments of rest. Our hearts work very hard for us throughout the day. When we invert ourselves, the blood flows more easily toward our hearts and heads, allowing the heart to take a break. This also reduces blood pressure and heart rate. However, there is no evidence as to how exactly this lowers blood pressure, and because this is not completely understood, inversions are not recommended for people with high blood pressure. We all have tissues and fluids in our body that get concentrated in different places, oftentimes in the lower body simply because of gravity, which create varicose veins and hemorrhoids. When we go upside down, those fluids drain from our lower body, clearing up any congestion that has gathered. This includes blood, as well. Our circulation is part of our lymphatic system – the system in the body that removes waste contributes to our immunity and releases healthy, disease-fighting blood cells throughout the body. When we turn upside down, we stimulate our lymphatic system and therefore strengthen the immune system and rejuvenate any underused areas in the body. Inverting the head can also help clear blocked sinuses and lungs. Clearing out these vulnerable areas helps keep away viruses like the common cold and flu. If you ever feel like your energy begins to wane around mid-afternoon, get yourself upside down! All that blood flowing to your brain benefits more than just your heart. It’s a natural brain boost, giving you more energy to finish out the rest of your day. So you’ve finally mastered the standing balancing poses and you’re looking for something else to tackle? 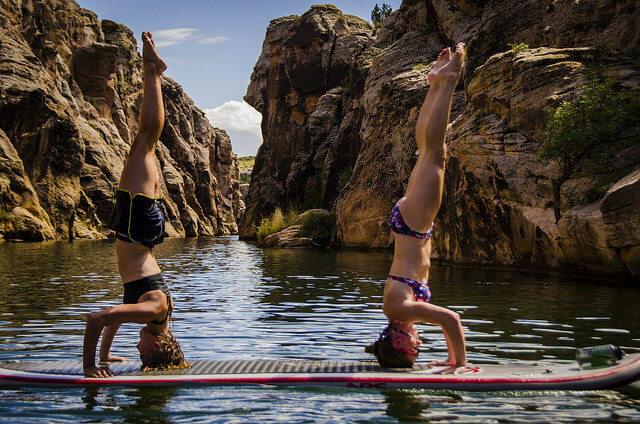 Inversions might be your next challenge. Inversions test our balance in a much different way than when we’re standing on one or both feet. When we balance upside down, it creates an entirely new dimension. It literally flips our perspective upside down. Let’s be honest, it’s easy to get away with not using our core in a lot of standing asanas…just wear an oversized shirt and nobody will notice, right? But nobody’s going to get away with that in an inversion. Core strength is a must when it comes to holding yourself up and staying balanced, especially in poses like Headstand, Tripod Headstand and Handstand, among others. Especially for women who tend to be stronger in their lower bodies than upper, it’s imperative that we build up our core strength and gradually work towards the more advanced inversions. It takes a lot of practice and patience to not only get yourself up but stay in an inverted pose. When you do, though, it’s like a rush of adrenaline. It’s proving to yourself that you can do it and that you can overcome obstacles. This confidence all of a sudden flows into the rest of your life, making a lasting change. You have to focus when you’re upside down. If you lose focus, you fall. Enough said. With that, we all lose focus sometimes, and falling is humbling. Practicing inversions is a good way to learn the notion of non-attachment. Ultimately, inversions aren’t about being perfect in the pose - they teach us to stay present and persevere, regardless of our circumstances. This applies more to the cooling inversions, such as Child’s Pose or Legs up the Wall. These inversions calm down our nervous system and bring our attention inward. They make us feel more balanced and peaceful. We’re surrounded by notions of right and wrong in this life. But inversions teach us to look at things from a different perspective. Getting upside down is different for everybody, and there’s no ‘one way’ to do it. What works for you might not work for the next yogi. Spending time upside down changes the way things look, literally and figuratively. Sometimes inversions help us to see things more clearly, and this translates into our everyday choices, making it easier to know what it is we really want for our lives. Inversions are fun! Even when we’re not nailing them, it’s fun to try and fall every once in a while, too. And sometimes having fun is just enough! There are many modifications for inversions and it’s recommended to begin with the modified versions, especially with the more advanced poses, when you’re just starting out. You can use props like a block, yoga wheel or even a wall to build up your core and upper body strength and to work on your balance until you feel ready to fly on your own. Blocks and bolsters are great ways to support the back and help us stay balanced in inversions. If you’re opting for a more restorative inversion, you can place a block or bolster, either will work, underneath your sacrum (lower back) in Legs up the Wall Pose. This will lift your hips a little higher, taking any extra pressure off your spine and possibly even raising them higher than your heart. Another good option for a supported inversion is Setu Bandha Sarvangasana (Bridge Pose) with a block. While Bridge and Supported Bridge poses are technically backbends, they also qualify as inversions as the hips are higher than the heart, and the heart is higher than the head. To come into Supported Bridge, you’ll start by lying down on your back. Bend your knees and slide your heels toward your hips to place where your fingertips touch your heels, soles of the feet on the mat. Take a deep breath in and lift your hips toward the ceiling. Place a block beneath your sacrum, right at the base of the spine. Play with the height of the block here. There are three levels to choose from, so start at the lowest level and go from there. Stay for three or four minutes. Then, release the block, lower your hips back to the mat and come into Shavasana. Another way to use blocks with inversions is to use them as a stabilizing aid. This is perfect if you’re new to going upside down and want a little extra help staying there. You’ll need three blocks and a wall without any obstructions above, behind or directly beside you for this practice. Set up your yoga mat so the top (short-edge) is against the wall. Then you’ll place one of the blocks, at its tallest setting, about one inch away from the wall. Its most narrow and tallest side will be facing the wall. Then, you’ll stack the final two blocks on top of the first, but at their lowest setting—so the shortest end will be touching the wall. From here, you’ll come to a tabletop position facing the wall, just behind the blocks. Come down to your forearms and interlace your fingers around the back of the bottom block. Make sure to keep your elbows directly below your shoulders. The crown of your head will come to the mat and the back of your head will rest against the bottom block. Start to lift your hips up and back as if you were coming into Downward-Facing Dog or Dolphin poses (see more on how to do these below), curling your toes under and lifting the knees off the floor. Begin to walk your feet toward the wall until you feel your upper back press against the top two blocks. Shift your weight into your forearms so there’s little to no weight on your head and neck. Really activate your arms and core here, like you’re pressing the floor away from you. Now, keeping that core really strong, begin to lift one leg up towards the wall and then slowly float the other leg up with it. You can rest your heels against the wall to start, and when you feel comfortable, see if you can move them away from the wall. To stay balanced with your feet directly above your head, zip up your legs and squeeze your inner thighs together. Press your heels toward the ceiling and keep pressing your forearms into the earth and your core activated. When you’re ready to come back down, bend one knee into your chest, keeping your core strong, and the other leg will gently float down with it. Come into child’s pose and recover your breath. The yoga wheel is one of the newer yoga trends at the moment. It’s typically used for support in backbends, but can also be used as a stabilizer in a forearm balance. In the same way we used the blocks above, you can hold onto the wheel (the side closest to you) while balancing on your forearms and pressing the back of your head into it. Another great way to use the yoga wheel is in Shoulderstand and Plow poses. Similarly to supported bridge with the block, you’ll place the yoga wheel underneath the hips. This will give you extra support under your lower back and more lift to raise your hips higher. Practicing inversions against the wall is a great way to build strength and stability. One common way to practice against the wall is to start by facing the wall and lifting your legs up into Headstand or Handstand and allow your feet and back of the legs to rest against the wall. However, this is not the best use of the wall. While this does help you stay up in the pose a little longer, it doesn’t really help with any strengthening in the long run. A better way, that will strengthen your core and upper body while allowing you to go upside down, is to come into Half-Handstand. Start with the top of your yoga mat against the wall. Then come down into Dandasana (Staff Pose), with your heels right up next to the wall and your legs long. So you’ll be facing the wall here. Make a mental note of where your hips are on the mat, or you can use a block to mark the spot. This is where you’ll place your hands for Half Handstand. Come down to a tabletop position, on your hands and knees, with your hands in a place where your hips and buttocks were previously and the soles of your feet against the wall. Take a deep breath in and begin to walk one foot up the wall. Start to straighten your other leg and lift your hips toward the ceiling. Then walk your other foot up the wall. You want your body to be in an, ‘L’ shape here. Your legs will be parallel to the earth and your upper body parallel to the wall. Get really strong in your core and press through all five fingertips, like you’re pressing the floor away. Find a place where you feel strong and stable. Stay for five or ten breaths, and come down by releasing one leg at a time, coming back to your tabletop position and then into Child’s Pose to recover. Down Dog is a great inversion because it’s accessible, it doesn’t take up too much energy and it feels amazing. To come into Down Dog, start in a tabletop position. Make sure your wrists are directly beneath your shoulders and press all five fingertips and the palms of your hands into the mat. Curl your toes under and press your hips up and back, moving from your core. You might need to adjust your hands and feet a little bit so shift around until you find the shape that works in your body. You want to bring the weight back into your legs—you’ll do this by pressing firmly into the mat with your hands. It’s common for beginners to have their chests too far forward, so really press your chest towards your thighs and your heels to the earth. They don’t have to touch—in fact, if you have tight hamstrings, it’s okay to keep a slight bend in your knees. Allow your head and neck to release, with your gaze at the mat or your toes, and stay for 5–10 breaths. Dolphin, similar to Down Dog, is perfect if you want to go upside down but want to try something a little different. It’s also a great way to build strength in the upper body and core, preparing the body to get upside down a little later down the road. For Dolphin, you’ll start in Down Dog. Take a deep inhalation and slowly lower your elbows to the mat. Keep the palms of your hands pressed into the mat, and walk your feet in towards your elbows, just a couple inches at a time, until it feels just right. As in Down Dog, press your chest to your thighs, let your head relax and keep breathing. Headstand prep is a great way to get used to standing on your head and for building strength in your upper body. Come into Dolphin Pose to start. Interlace your fingers into a fist and then separate the palms of your hands a couple of inches, just wide enough to hold an apple there. Bring the crown of your head down to the mat and rest it between your wrists. Be sure to not let it fall into the palms of your hands. Get active in your forearms, shoulders and core. Then start to walk your feet, slowly, toward to your head, as close you can. Hold for 5–10 breaths. Walk your feet back, lift back up into Dolphin and then come into Child’s Pose for rest. First, find your wall. Turn to either side so one of your shoulders is right up against the wall and, keeping your shoulders next to it, lower your hips to sit on the floor at the base of the wall. We start like this so you can keep your buttocks close to the wall the entire time. Sit down onto your buttocks and then lower your upper body to the floor, onto your back. Lift your legs up toward the ceiling and scooch your buttocks as close the wall as you can. You can place your arms wherever feels good to you. Close your eyes and let yourself relax. Come into slow, deep breaths and stay for 5–10 minutes, or however long feels good for your body. Paying attention and staying present are two requirements for inversions, especially when it comes to the more advanced poses. Remember when we talked about all that blood that flows to our brains as we invert? That fresh supply of blood reenergizes us and helps us come back to the present moment. Sometimes it just takes a few moments of presence to remind us that we are okay. When we’re present and press pause on our thoughts, we stop focusing on those thoughts and we gain a new perspective. Sleep deprivation is the worst. It can lead to stress and anxiety and be an overall pain. Luckily, there are ways to help aid sleep. When we go upside down and the blood rushes to our hearts, we tend to relax. This is especially true in the more restorative inversions. They also help our minds calm down and relieve any tension we may be carrying. Headaches or migraines caused by excess tension can certainly be helped with inversions. With more circulation throughout the body, we simultaneously energize the body and release tension. And inversions help us do just that. Here a few poses to try next time your head starts to throb. If you have high blood pressure, whether you are taking medication or not, you should check with your doctor before doing inversions. Like we said before, those who have high blood pressure but are treating it with medication can usually practice inversions just like anyone else. But if you have untreated high blood pressure, it really is best to talk first with your doctor. This is a highly controversial topic. Opinions on whether or not to practice inversions, or any yoga at all, while menstruating vary. There are some teachers who believe that going upside down while on your period interrupts the natural downward flow of the cycle. And then there are others who recommend inversions to help alleviate symptoms of PMS. And to further the contradictions, some teachers will advise not taking an inversion such as Headstand or Shoulderstand, but at the same time give no warnings about other asanas that tilt the pelvis, such as Down Dog and Uttanasana (Standing Forward Fold). There are some theories that practicing inversions while menstruating can lead to endometriosis in the long run—but this theory isn’t backed by science. Overall, there haven’t been any hard studies done to prove one right or wrong way to practice while on your period. When it comes down to it, it’s your body. If you’re someone who feels like inverting while menstruating makes you feel really good, then go for it. But if you’re someone who just really doesn’t want to flip yourself upside down while Aunt Flo’s in town, then don’t. Periods can be uncomfortable all on their own, there’s no reason to add the discomfort if you don’t need to. Yoga is a great practice to incorporate into your routine while you’re trying to conceive. It’s a great way to build up strength, balance and endurance, readying your body for the months to come. As for whether or not to practice inversions while trying to conceive, it’s probably best to stick with the gentler ones. 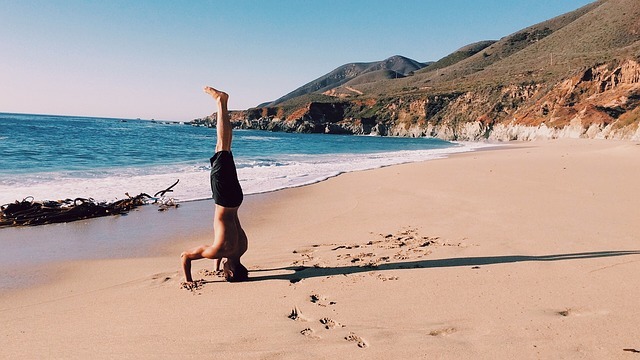 Anything that creates a lot of heat like Handstand or Headstand, might be a little too much for your body. Also, these asanas require a lot of strength and practice before you’re able to hold yourself up. Because of this, injuries are more likely to happen in these advanced poses, which is not what you want right before you get pregnant. The one exception here is if you’ve been practicing these heating inversions for a long time and feel very comfortable in them. Otherwise, stick with inversions like Legs up the Wall and Supported Bridge. Who knows, maybe the reversed gravity will actually speed up the conception process! If you have any doubts about whether or not you should start practicing inversions, whether it’s due to a medical problem or personal issue, ask your doctor and yoga instructor. This is especially true for people who suffer from diabetes or insulin resistance, cardiovascular disease/hypertension, glaucoma/eye problems, any back/spinal issues, ear/sinus infections or if you’re pregnant. Inversions are a fun and exhilarating way to spice up your yoga practice, re-energize your health and build strength while improving balance. They can help you find a new perspective to approach life with, one that will ultimately make you a little happier along the way. Remember, start small. It’s better to take baby steps and gradually work yourself upside down safely than to jump into it all at once. Start where you are, with what you have and you’ll reap the benefits of flying upside down in no time. Would you like to experience the amazing benefits of inversion yoga poses and become a master going upside down? 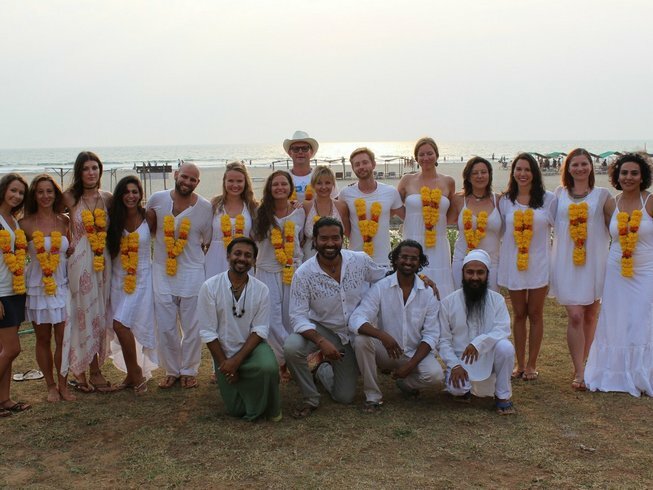 Go on an advanced yoga retreat and practice all forms of inversions! 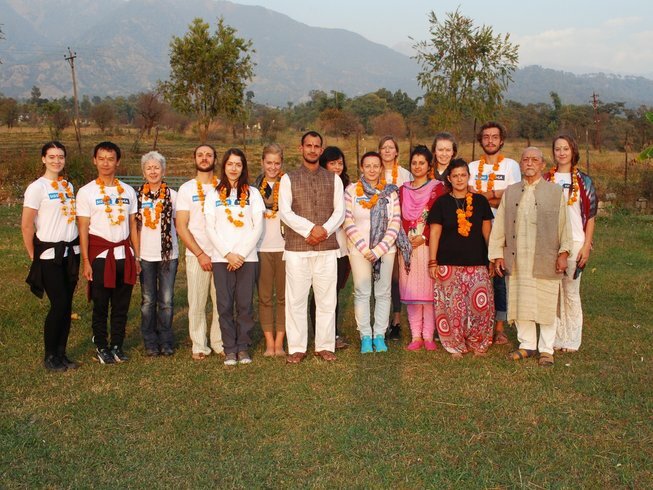 This article was originally published on SiddhiYoga. Meera is a yoga teacher, entrepreneur and mom. Her writing on yoga and holistic health has appeared in Elephant Journal, Yoganonymous, OMtimes and others. She’s also the founder and owner of Siddhi Yoga International, a yoga teacher training school based in Singapore. We have the best deals and offers from 3000 organizers all over the world! Get them into your mailbox every week!